A true quiche classic! 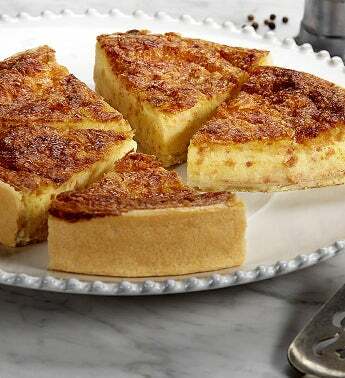 Savory, delicately seasoned creamy egg custard swirled with Swiss and Cheddar cheeses, soy bacon crumbles and a touch of onion in a tender, flaky pastry crust. Each quiche arrives in a signature Bake Me A Wish box.